GroupDocs Cloud Newsletter February 2019 edition brings together updates, news and information from recent API releases and other happenings during the last month. 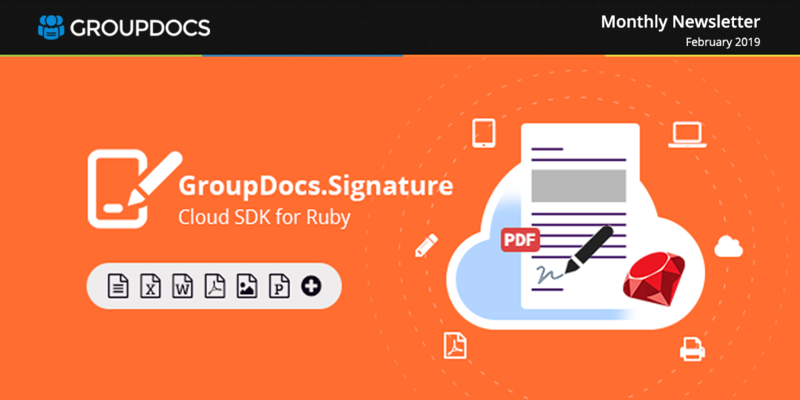 Major highlight of the month is GroupDocs.Signature Cloud SDK for Ruby platform, which helps you in incorporating different e-signatures into Microsoft Word, Excel, PowerPoint, PDF, OpenDocument and image file formats in your Ruby based Cloud apps. In other news, rendering your Microsoft Outlook data files of PST, OST and CGM formats within your cloud apps becomes that much more convenient with the help of GroupDocs.Viewer Cloud SDKs. Looking to annotate your business documents and images? Try GroupDocs.Annotation Cloud REST APIs, which include advanced document annotation features for a host of file formats.